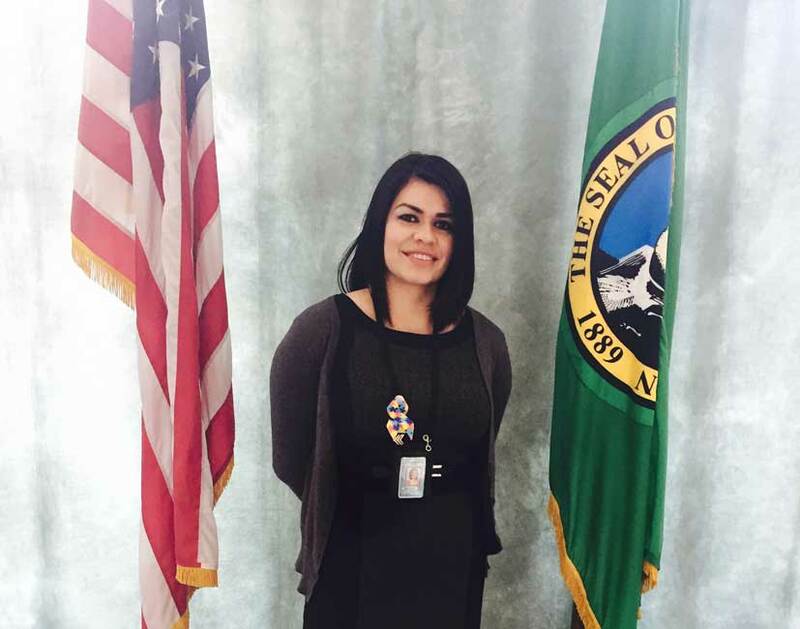 MONROE – Ensuring staff and inmates have a safe, inclusive environment is important to Maria Angel. 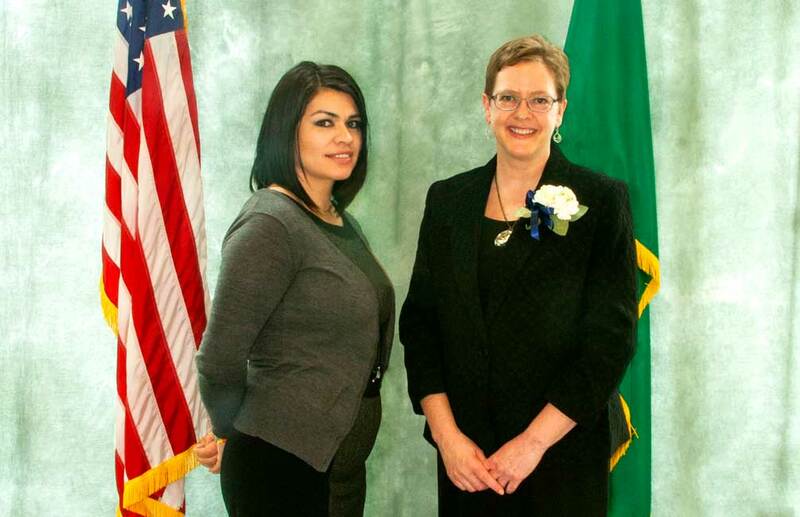 Angel, who is an administrative assistant at Monroe Correctional Complex (MCC), recently received an Agency Award for Diversity at a ceremony in Tumwater, Wash. on April 14 for her work to educate staff and inmates about the lesbian, gay, bisexual, transgender, queer and intersex (LGBTQI) population. "Talking about people's differences helps to break down barriers, preconceived notions, and prejudices," Angel said. "Often times this leads to a mutual understanding and realizations. We all have different cultures and upbringings, but we are all people and all races and cultures who contribute to society." Angel is the current chair of the Diversity Advisory Council at MCC. There are councils at every prison and the department's headquarters. The council takes an active role in fostering diversity and inclusion in the workplace by sponsoring educational diversity events and activities throughout the year to improve staff relations. Studies demonstrate that enhanced understanding of individual behaviors and cultures of incarcerated individuals can yield more effective verbal and nonverbal communications between correctional staff and inmates, leading to safer facilities and correctional operations. Angel is also the volunteer sponsor for the LGBTQI Unity group at the prison's Twin Rivers Unit. The LGBTQI Unity group, which launched in January, is comprised of about 25 inmates who identify as part of the LGBTQI community as well as inmates who support their LGBTQI peers. The group meets weekly to talk about shared challenges they've experienced as members of the LGBTQI community before and during incarceration, and ways staff can interact with them to create a safer, more comfortable environment. A study published in the February 2017 American Journal of Public Health found the incarceration rates among people who identify as lesbian, gay, or bisexual is more than three times that of the U.S. adult population (1,882 per 100,000). Moreover, the study found this population is more likely to have experienced sexual victimization as children and continues experiencing psychological distress as adults. The hardships members of the LGBTQI community experience are something Angel wants to help ease. She met three transgender panelists at a recent Diversity Advisory Council chair meeting and was inspired to raise awareness of LGBTQI issues among staff and inmates alike. "After that day I knew I had to do something in the facility to educate staff and help the incarcerated individual population," Angel said. Angel has facilitated several educational and support sessions with staff, including a race relations open forum, led by Montanna Morton, the department's diversity and inclusion consultant for the Northwest region. She's also working with inmates to organize a pride event in June with several guest speakers. Though the inmate LGBTQI Unity Group has been official for only a few months, Angel says there's already been an improvement in staff and inmate interactions, such as the use of preferred gender pronouns. "During our first meeting, the group thanked me and said they noticed a change in how staff were now referring to them and even had a few staff members say how they now understood." She says the most rewarding part of working with the LGBTQI inmate group is "seeing a group of people once ostracized having an outlet in a safe group setting, and being able to talk about their lifestyles around like-minded individuals. It allows them to be more comfortable with themselves, with the individual population, and ultimately make everyone more comfortable with themselves."